I’m using a reprint of an article I first published on 22 February 2014. I should explain that today, 12 April 2018, our dog, Jasmine, was attacked by another dog that was not on his leash. As I felt the emotions of the drama in the park today, and then read the emotions of the article I wrote four years ago, it reminded me of the attachment we have with our pets. I should also say that it was much more traumatic for me to watch Jasmine being attacked than it was for her. The dog, likely a pit bull, was bigger than Jasmine and instantly grabbed her by the throat. The dog’s owner and I pulled them apart and I saw the wounds on her throat and took her immediately to our veterinarian. She had to have the wound opened and cleaned, but she will be fine. I overuse our animals in this blog, but they are great subjects that don’t object to being photographed. Jasmine has been with us for about a year and a half. She still has some anxious quirks, but she is getting better. She loves to run, but we can’t let her off leash. Our solution has been to ‘allow’ her to pull us to and from Alexander’s school every day. 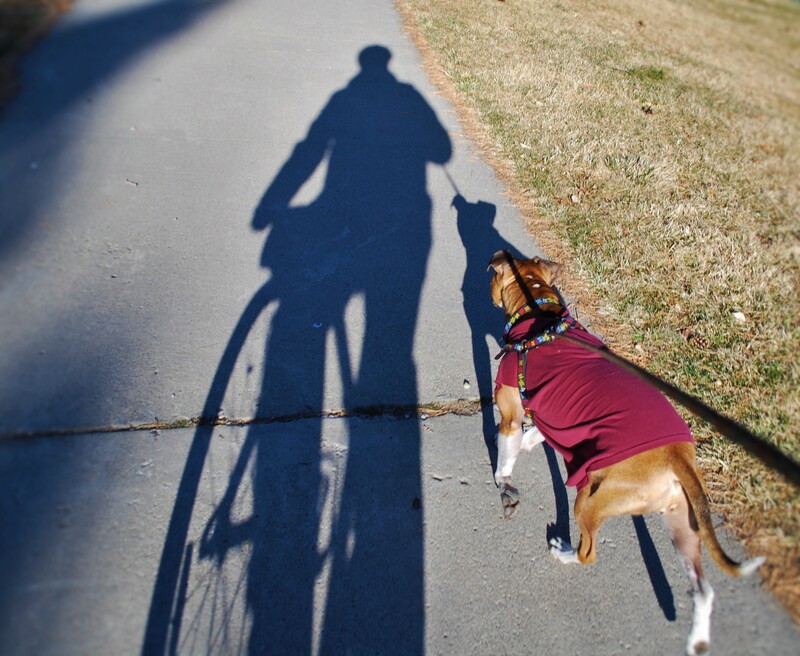 Her top speed is about 22 mph, but I would guess that she could do almost 30 mph if she was not pulling a human on a bike. She doesn’t need guidance as she knows the way, and she would prefer to not slow down for Stop signs. Her special talent is the ability to make people smile. As college students walk to class, they can’t help but grin when they see this 40-pound dog pulling us down the street on our bikes. I’m sure it can be nerve-wracking for them as Jasmine comes racing up from behind, but she almost never breaks stride when passing a pedestrian. As I’ve gotten older I’ve come to appreciate the gift of animals. It is hard to understand why pets love humans so much, but I completely understand why humans love them.